What is your service availability? IBM Aspera on Cloud is generally available in many regions for Amazon Web Services (US, EU, APAC), IBM Cloud (US, EU, APAC), Microsoft Azure (US, EU, APAC) and Google Cloud Services (US). What types of storage do you support? IBM Aspera on Cloud supports on-premises block storage such as SAN and NAS. We also support object-based storage including Amazon Web Services S3, Google Cloud Platform, IBM Cloud Object Storage S3, Open Stack Swift (IBM Cloud), Microsoft Azure BLOB and Microsoft Azure Files. You automatically have access to the new IBM Aspera on Cloud web application. In the interface, you will find a new experience for many familiar features such as package creation and delivery, file sharing, and file and folder search. When you upgrade, you will see the new administration interface, an application view that includes configuration of access keys. 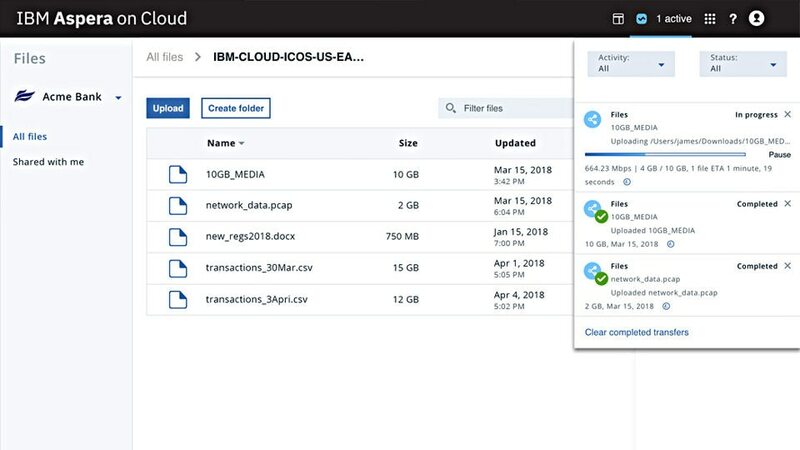 You will also be able to access and transfer data to, from and between cloud object storage buckets using Aspera on Cloud web and mobile apps. There are two new concepts to be aware of when you upgrade. 1) Application views separate files, packages, administration and monitoring into distinct modes. 2) Inboxes are a new construct for package delivery. They replicate many of the elements of a standard email inbox such as notifications.